Textiles can be dyed in the state of fleece, yarn, or when the product is finished, depending upon the objective. Which color is popular changes quickly, especially considering how fast-moving trends are in the fashion industry. If cashmere is dyed as fleece, which is in the earlier stages of the knitwear production cycle, the risk of missing out on a trendy color can be quite high. Italy’s Benetton surprised the whole industry with a new process of knitwear production by manufacturing sweaters with undyed colors in the offseason, and once the season’s popular color was known, the sweaters were dyed in their final state. It was a revolutionary action that was a significant breakthrough for the company. 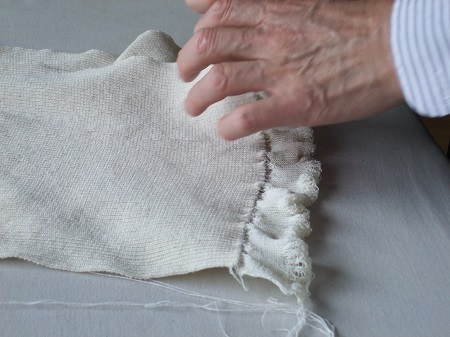 However, cashmere is too delicate to follow this pattern: its texture could be destroyed. Many people are surprised to see that our cashmere yarn does not look soft and fluffy. The knitted item before the final process is rather hard. Cashmere knitwear has to go through a wet finishing process called “fulling.” Put simply, it means washing the knitwear. Of course, it is not only a simple washing task. It involves bringing to the surface the down twisted inside, which requires knowledge and high skill. Fulling will cause slight shrinkage. When knitting a sweater, the final size after fulling needs to be taken into consideration. The product size needs to be estimated and adjusted depending upon the desired final size. Fulling will also impact the texture of knitwear. How the yarn is twisted and how dense the knitting is are other factors in how much change can occur. Strictly speaking, the weather has some influence: for example, clear and dry days or cold days in winter have different effects. Humidity, in particular, has an impact on knitting. Skilled workers fine-tune the room temperature and humidity. An experienced knitter can tell if the knitting machine is working smoothly or not by sliding it a few times. People have various preferences for texture and softness. People in the UK are said to like a solid surface and find the way it softens over time more favorable; Japan and Italy seem to prefer a softer touch from the beginning. Our cashmere is relatively firm, as British people may like. After fulling, the knitted fabric has to be dried. There are drying machines now to do the job fast, but we use natural air drying. It takes time and effort, but it is certainly better and gentler on cashmere.